Wise choices about how to use your income and credit when you’re young—or if you get a late start—help you build a strong foundation for a lifetime of financial security. Prioritizing spending, establishing a savings habit and keeping consumer debt to a minimum enables you to achieve important financial goals sooner. And once you understand the basics of taxes, borrowing and banking, you’ll be well prepared for even greater financial responsibilities and opportunities. Many workers are surprised to find that their take-home (net) pay is less than what they earned (gross pay) because of various deductions. Federal and state income taxes typically take the biggest bite out of earnings. How much is withheld from your check depends in part on the number of allowances you claim on the Form W-4 your employer provides. Follow the instructions on the form or use the calculator at the Internal Revenue Service (IRS) website to determine the correct number of allowances. If too much is withheld, you’ll receive a refund when you file your tax return between Jan. 1 and April 15. A refund is nice, but it is better to have the correct amount of tax withheld from your paychecks so that you can spend or save your money throughout the year. Social Security (FICA) and Medicare (MedFICA) taxes pay for government-sponsored retirement and health care benefits for eligible seniors. These taxes are nonrefundable. There may also be state-mandated deductions for things such as state-sponsored disability insurance. Other deductions are voluntary, such as your share of the cost of your employer-sponsored health insurance and contributions to an employer-sponsored retirement plan. If you use a paid tax preparer, avoid “refund anticipation checks” and prepaid cards that the preparer offers you. These products do not deliver your refund faster, and they take a big chunk out of it in unnecessary fees. The Volunteer Income Tax Assistance (VITA) program offers free basic tax preparation for low-income, disabled, elderly and limited-English-speaking taxpayers. VITA sites can also help you open a bank account or get a low-cost prepaid card, which enables you to get your refund in as little as 10 days when you e-file your return. 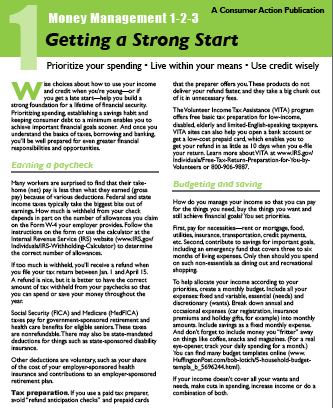 Learn more about VITA at the IRS website or 800-906-9887. How do you manage your income so that you can pay for the things you need, buy the things you want and still achieve financial goals? You set priorities. To help allocate your income according to your priorities, create a monthly budget. Include all your expenses: fixed and variable, essential (needs) and discretionary (wants). Break down annual and occasional expenses (car registration, insurance premiums and holiday gifts, for example) into monthly amounts. Include savings as a fixed monthly expense. And don’t forget to include money you “fritter” away on things like coffee, snacks and magazines. (For a real eye-opener, track your daily spending for a month.) You can find many budget templates online. A checking account allows you to write checks, use a debit card or use online banking to access money you deposit. It can help you manage your money and avoid the costs of check cashing services, prepaid cards and money orders. A savings account provides a safe (insured) place to keep your money until you need it, and it pays a small amount of interest. You can set up your accounts at a bank or a credit union. Shop around: Compare monthly and transaction fees, initial deposit and minimum balance requirements, interest rates and other account terms. Compare bank accounts in your area at Bankrate.com. Find credit unions you may be eligible to join at www.aSmarterChoice.org. Most financial institutions require two pieces of ID to open an account, one with a picture on it. If you are a non-citizen and non-permanent resident who is opening only a non-interest-bearing checking account, the financial institution might accept a consular ID card or non-U.S. passport. If you want to open an interest-bearing (savings) account, you’ll need an Individual Taxpayer Identification Number (ITIN). If one bank is not satisfied with your ID, try another one—requirements vary. Understand what types of activities will result in an account fee, and then take steps to avoid them. For example, keep close track of your balance to avoid overdrawing your account and incurring an overdraft fee. Use your bank’s own automated teller machines (ATMs) to avoid an ATM surcharge. When reordering checks, it is probably cheaper to purchase them from a mail-order company than from your bank. Although the debit card that comes with your checking account may have a Visa or MasterCard logo on it, it is not a credit card. The cash you withdraw at the ATM and the money you spend will be deducted directly from your checking account. Check your monthly account statement as soon as it arrives to verify that all deposits, withdrawals, debits, checks and fees are accurate. Reconcile your account by following the step-by-step instructions on the statement or online. This will help you spot errors and avoid overdrafts. If you are denied an account, ask why. It may be because your name is in the ChexSystems database, which collects information about mishandled checking and savings accounts and reports it to banks that request the information when evaluating an account applicant. You have the right to one free copy of your ChexSystems report each year or whenever your account application is rejected. Request yours at www.ConsumerDebit.com or call 800-428-9623. Certegy and TeleCheck are databases of returned checks. If your check was not accepted at a store, you can order a free report from Certegy (866-740-3276) and TeleCheck (800-710-9898). Learn more about checking and savings accounts in Consumer Action's Checking and Savings Accounts module. Credit can help you handle a financial emergency and achieve financial goals. But credit can also get you into financial trouble if you don’t understand how to avoid high finance charges, growing debt and unmanageable monthly payments. There are two types of credit: installment and revolving. Installment credit requires you to make fixed monthly payments until you repay the full loan amount. Car loans and home mortgages are examples of installment credit. In these cases, the loan typically is secured by the property you purchased with the borrowed money. If you default on the loan (don’t repay it), the lender can repossess your car or home (the collateral). Revolving credit allows you to borrow money over and over again, up to your “credit limit.” The amount of your available credit fluctuates as you use it and then repay it. You have the option to pay the entire balance when the bill is due or to pay a part of it and carry over the remainder to the following month. You can avoid interest charges by paying it off each month. Examples of revolving credit include credit cards and lines of credit. Banks, credit unions, credit card companies, retailers, mortgage companies and others offer credit. The cost of credit includes interest—what the lender charges for allowing you to use its money—and various fees. Some types of credit, such as pawn loans and payday loans, are best avoided because of their exorbitant interest rates and fees. With these and similar types of loans, you are at high risk to lose your collateral or get locked into a cycle of refinancing an ever growing debt. You have the right to upfront disclosure of all credit terms and costs (truth-in-lending). If you are denied credit, you have a legal right to know why. Learn more about your rights from the Federal Trade Commission. If you have never had credit, or if you didn’t pay your bills as agreed, you may have a poor credit history or no credit history at all. Without a good credit history, it can be difficult to buy or rent a home, start a business, get insurance, set up utility service, borrow money or even get a cell phone. Some employers reject job applicants with bad credit. Because it can take time to establish and build a strong credit history, it’s wise to begin the process even if you don’t need the credit right away. Seek out opportunities. Try to get a card from a retailer or gas company, which is sometimes easier than qualifying for a general-purpose credit card. If you’re an immigrant without a Social Security number, you may be able to get a credit card with just an ITIN. A good place to inquire is with a local credit union or any of the financial institution partners of Bank On programs in your area. Get a secured credit card. This type of card is easier to get because you put up a deposit in the amount of the credit line, to be used by the card issuer if you don’t repay your debt. Eventually, if you pay your monthly bills on time, you could graduate to an unsecured card and get your deposit back. Find a cosigner. Ask a friend or relative with good credit to cosign your credit application. Be aware that if you don’t make the payments, your cosigner will be responsible for the loan, and his or her credit could be damaged. Keep your total outstanding debt to 30 percent or less of each credit line. Make at least the minimum payment by the due date. Don’t charge over your credit limit. Your credit report is a record of how you’ve paid your bills and managed your credit over the years. Information about your payment history is provided by your creditors to companies that compile the data. Other information, such as bankruptcy filings or tax liens, comes from public records. Your credit score is a three-digit number, usually ranging from 300 to 850, that summarizes the information in your credit report. Rather than review your entire report, businesses make a decision just by looking at your score. Many major credit card issuers and banks are now providing free FICO credit scores—the most widely used type of score—to their customers. And FICO scores are also available for free to consumers who seek financial help through non-profit credit counseling agencies. If you can’t get a free FICO score through any of these sources, you can purchase it at myFICO.com. You can also purchase scores at AnnualCreditReport.com and the website of each of the three major credit reporting agencies (Equifax, Experian and TransUnion), though they may not be FICO scores. Card comparison websites CreditKarma.com, Credit.com and CreditSesame.com offer free credit scores online. While they may not be the same scores that lenders use, they can give you an idea of generally where you lie on the creditworthiness scale. Beware of offers of “free” credit scores that enroll you in a monthly fee-based credit monitoring service. Be sure to check your credit reports regularly to catch any errors and to know where you stand. You can get one free credit report every 12 months from each of the three credit bureaus at AnnualCreditReport.com or 877-322-8228. You’re also entitled to a free report from the credit bureau that supplied it if a company denies your application based on the content of that report. You must make your request within 60 days. Do not fall prey to credit repair scams that promise to remove derogatory (negative) information from your report for a fee. You can do anything these companies can do at no cost. Only discipline and time can repair damaged credit. The ability to shop safely online, buy airline tickets or rent a car or hotel room. Interest rates are high relative to some other loans. Purchases cost more if you carry a balance from month to month. Cash advances begin to accrue interest immediately, even if you pay your full balance by the due date. They also might incur a higher interest rate than purchases, and there is often a per transaction fee when you get cash. It’s possible to remain in debt indefinitely and waste much of your income on finance charges. Credit card interest rates, fees and other terms and conditions vary widely. Compare cards at websites such as CompareCards.com, CardRatings.com and Credit.com. Cards that earn you points, miles, cash back or other rewards for spending can be tempting, but they can cost more in annual fees and higher interest rates than the rewards are worth. Make at least the minimum required payment by the due date each month. Pay your balance in full as soon as possible. Avoid fees and penalty interest rates by paying on time. To avoid accumulating debt, try to use cash to purchase everyday items such as groceries and gas. Save up for major purchases. If it’s getting difficult to make monthly payments, stop using credit and contact the National Foundation for Credit Counseling at NFCC.org or 800-388-2227 for help. Depending on your situation, a counselor might give you the option to participate in a debt management plan (DMP). Under a DMP, you would make one payment to the counseling agency, which would disburse funds to all your creditors. In turn, your creditors may agree to accept lower payments and waive or reduce interest rates and fees. Defaulting on student loans can result in damaged credit, wage garnishment or even loss of your tax refunds. If you’re having trouble making payments, it’s important to address the issue head-on to avoid these consequences. There are federal student loans and private ones. Federal loans offer more repayment options for borrowers. These include income-based repayment plans, forbearance and deferment. There may be other breaks for those who work for a non-profit or in the public sector. Private lenders don’t offer these programs, but may work something out with you—for example, allowing you to make interest-only payments—if you are struggling. Another option, if you have multiple loans, is consolidation, which could lower your interest rate or monthly payments. But beware of scams that offer to consolidate your loans for a fee. Learn more about managing your student loans in Consumer Action’s Student Loan and Education Resource List.